$25 per half hour, or $45 per hour (10% discount). Families with two or more students automatically receive the discount. Yes. In addition to tuition, there is a $50 registration ($25 re-registration) fee. This fee covers my time to complete the registration process-- communicate with a prospective parent by phone/text/email/FaceBook, process the registration form and enter the student's info into my phone and computer, prepare the lesson binder and dated assignment sheets for the first lesson, etc. The initial registration fee includes a free MidloPiano.com tote bag (a $12 value). Sheet music is included in a quarterly $25 materials fee. (WunderKeys students will need to purchase two or three books. Those books are copyrighted and cannot be copied). This fee averages $2 per week and includes sheet music, flash cards, reward stickers, reward candy, awards, ink, toner, paper, plastic sheet protectors, sheet music subscription fees, etc. A lesson once a week is recommended, especially with children. While most students take a half-hour lesson, some prefer a one-hour lesson. One-hour lessons are recommended for students who wish to progress faster, and for those who need assistance getting started with their new pieces. At my home in Midlothian, Virginia. How much does my child need to practice each day? A minimum of 15 minutes per day is suggested. Reinforcement and encouragement are critical to maintain a regular practice schedule. Young children may require assistance, especially if they can't read. What if we don't own a piano? Of course, there is no substitute for a real piano, but an electronic keyboard with standard-sized keys is an adequate substitute for a beginner. However, you should plan to replace it with a real piano within six months. Rather than buying an expensive piano at first, you might consider a used piano. Check the local classifieds. Several of my students have found a free piano on PianoAdoption.com . Leasing from a piano store is also an option. Generally, the first few months rent may be applied to the purchase of a new instrument. Cash, check, and credit/debit by Google Wallet. I can also process credit/debit cards manually through PayPal (you do not need to be a PayPal user), but I must pass along the transaction fee. Tuition is non-refundable. A $25 chargeback fee will be due for any reversed check or credit card transactions. Tuition is payable monthly by the first of the month, preferably at the last lesson of the month. By request, I will hold a post-dated check to the first of the month. There is a $5 late fee per student thereafter. Yes, but in the form of informal piano parties. Students will have the option of performing solo pieces and/or duets with me. They may use their music. Fun games like hot potato in which the "losers" provide the music take the stress out of performing. Not any more. My experience is that children focus better out of their play environment. 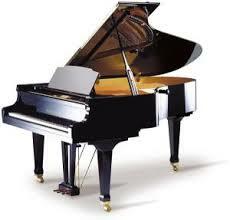 Plus they enjoy playing my 6'3" Baldwin grand piano. If we forget a lesson, do you charge? Yes, just as if you missed ballet or soccer. There will be no makeup lesson given since my time was spent waiting for you. If you are concerned that you might forget a lesson, please set a weekly reminder on your phone. May I cancel a lesson and not be charged? No, since lessons are pre-paid. However, a lesson may be re-scheduled. I am extremely flexible, but I ask that you be courteous and give me as much notice as possible. Other students are always looking for open spots for make-ups. DO NOT BRING A SICK CHILD TO PIANO. I will gladly schedule a makeup lesson rather than expose myself and/or the entire studio! This includes " just a cold ." May I sit in on my child's lesson? Absolutely! In fact, I would prefer it, especially with young children. The need for parental support at home cannot be overstated, so it is important for you to know what is happening at lessons. Do you teach in the summer? Yes!! Yes!! Yes!! Studying music is not like reading books or taking an art class for fun. It's learning a new language entwined in mathematical relationships. Taking the summer off sounds good, but it's like stopping a diet for the summer, or an athlete not exercising for 3 months. Most are frustrated because they cannot play like they did in May. Even their old music seems so hard. Picking up where they left off is out of the question. Spending months in review is discouraging. The excitement is gone. Many simply give up or think they need a new teacher. An adult who has been playing their whole life could do it, but children are a different story. If the student is taking piano as just another fun activity, no problem. However, if you are expecting an effect on brain development ONLY associated with music study, big problem! There are multiple citations on my website, and the Internet is full of information on how music develops neural pathways in children and boosts IQ. But these pathways will atrophy without use in a very short time. I teach all summer because it is that important. I am completely flexible with vacations and other activities, and try to make the lessons fun with more games and activities, music history, etc.. 15 minutes of piano a day will not spoil anyone's summer vacation and the effect is tremendous. Life-changing! What if my child won't practice, doesn't like it, etc.? Before enrolling, please make sure your child wants to take lessons and agrees to practice at least 15 minutes a day. I don't teach children against their will. Progress is necessary for the experience to be fun and rewarding. I use stickers, reward candy and prizes to encourage students to come to lessons prepared. You can have a reward system as well, along with tons of praise. If the child still doesn't want to practice, there could be a multitude of reasons. Let's talk about it ASAP. Please do not discontinue lessons without talking to me first. But should you decide to terminate lessons, 30-days notice is required at the time of payment of the final month's lessons. (i.e. "This will be our last month.") Failure to do so will result in you being charged an additional month's tuition. Tuition is non-refundable.